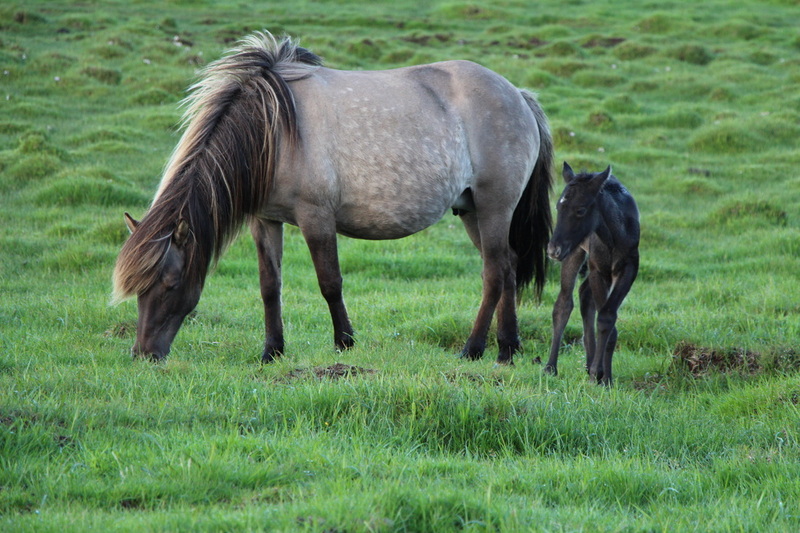 Son of Vökull frá Efri-Brú and Evelyn frá Litla-Garði. Hades frá Heimahaga is very promising young stallion, son of Herkúles frá Ragnheiðarstöðum (8.46) and Dröfn frá Stað. Dröfn is owned by Heimahagi along with six other Dröfn's offsprings. Hades is brother of Krít frá Miðhjáleigu, same mother. Herkúles frá Ragnheiðarstöðum (8.46) is a young and beautiful, chestnut tobiano stallion with 8.66 for Conformation; 9 for neck, withers, shoulders, 9 for proportions, 9 for legs and 9 for main and tail. 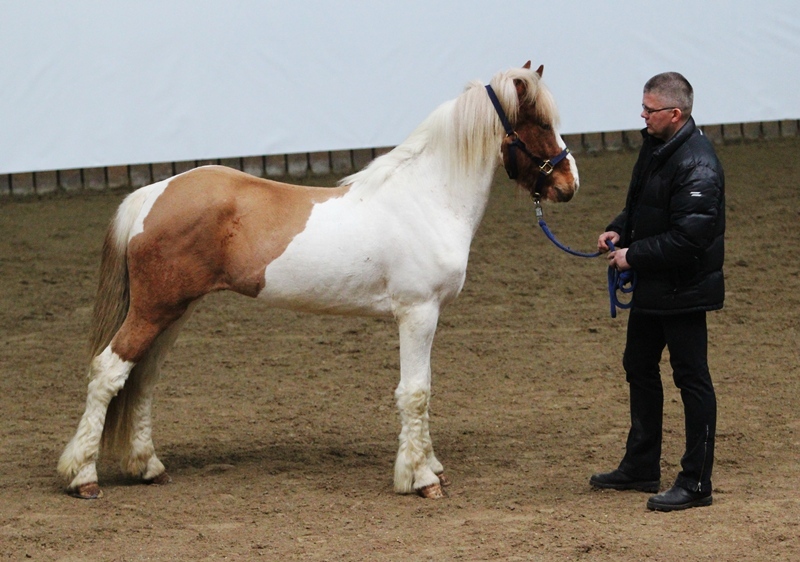 He is very talented four gaitor with 8.33 for Rideability; 9 for tölt, 9.5 for trot, 9 for gallop, 9 for spirit and 9 for general impression. F: Álfur frá Selfossi (8.46). Álfur is a great, four gaited, chestnut tobiano stallion, with 8.11 for Conformation and 8.69 for Rideability; 9.5 for tölt, 9 for trot, 9 for gallop, 9.5 for spirit, 9.5 for general impression and 8 for walk. 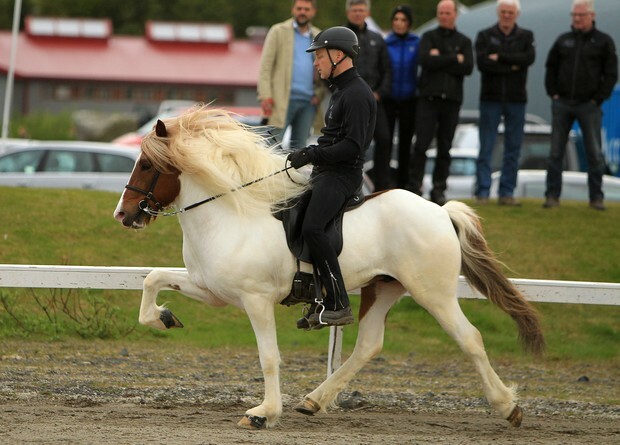 Álfur has also 8.5 for slow tölt and canter. Álfur got 1. price for his offspring at LM2011 and honorary award for his offspring at LM2012. ​FF: Orri frá Þúfu í Landeyjum (8.34). 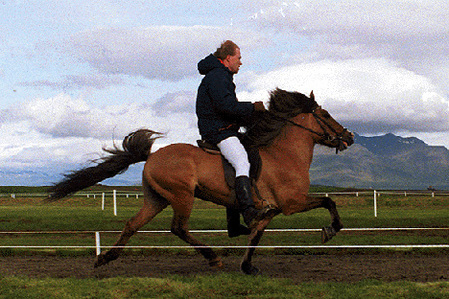 The black and great four gaited stallion Orri frá Þúfu had 8.08 for Conformationand 8.61 for Rideability; 9.5 for tölt, 9 for trot, 9 for gallop, 9 for temperament, 8 for character and 9.5 for general impression. Orri got 1. price for his offspring in 1996 and honorary award for his offspring at LM2000. FM: Álfsdís frá Selfossi (8.31). Álfadís is a chestnut tobiano mare with white sclera. 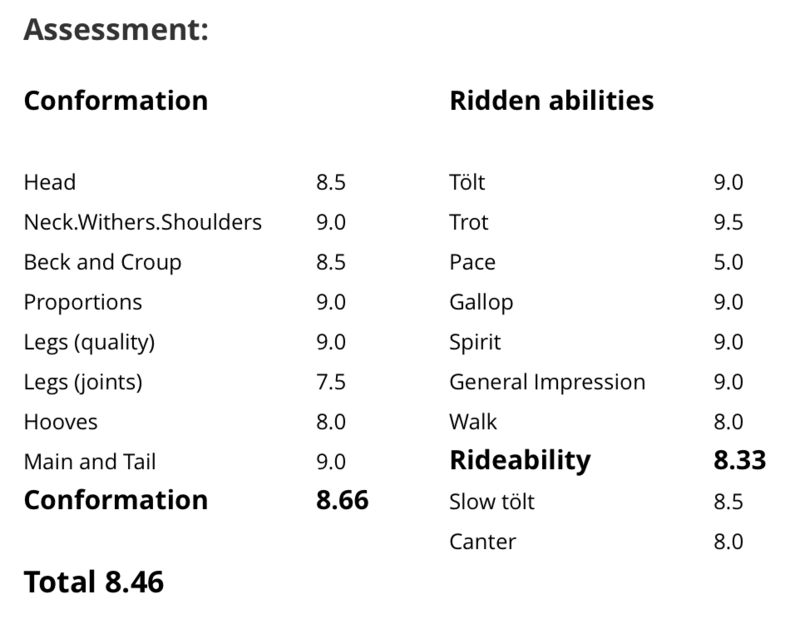 She has 7.78 for Conformation and 8.66 for Rideability; 9 for tölt, 9 for trot, 7 for pace, 8.5 for gallop, 9 for spirit, 9 for general impression and 9 for walk. Álfadís has also 9 for slow tölt. Álfadís got honorary award for her offspring at LM2011. 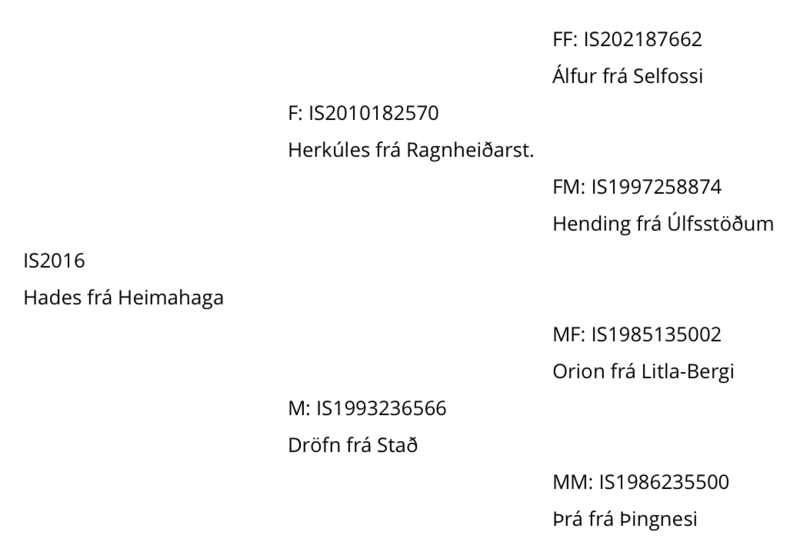 M: Hending frá Úlfsstöðum (8.47). 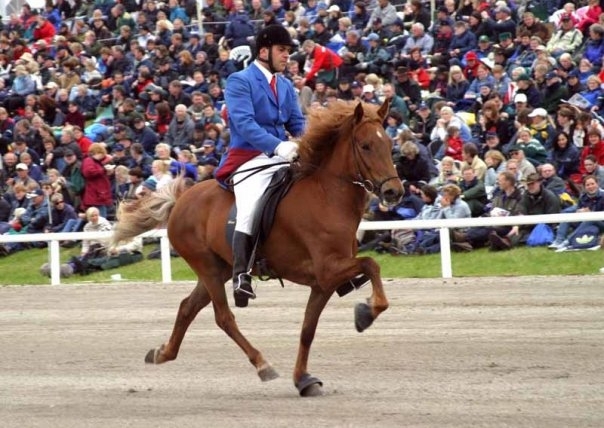 Hending is a great four gaited mare, she is liver chestnut with a star. 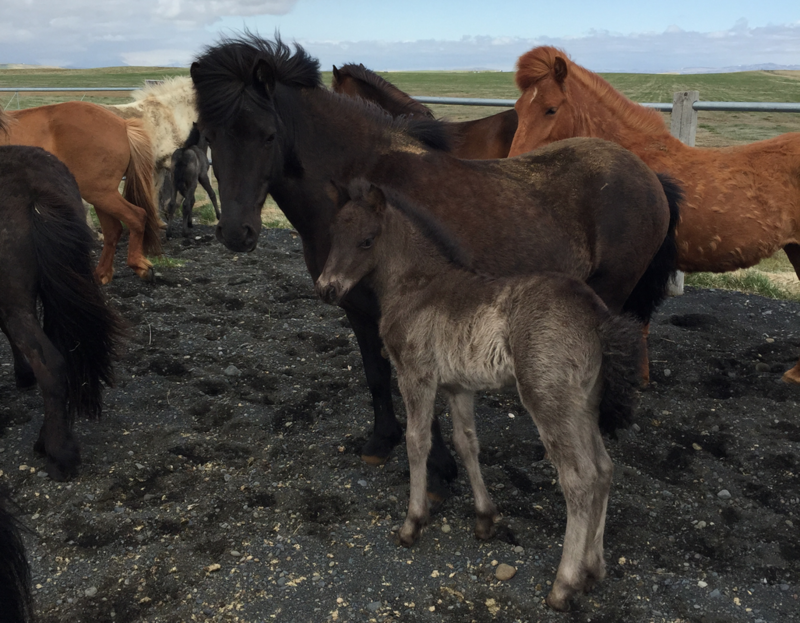 She has 8.26 for Conformation and 8.58 for Rideability; 9 for tölt, 9.5 for trot, 9.5 for gallop, 9.5 for spirit, 9 for general impression and 8 for walk. 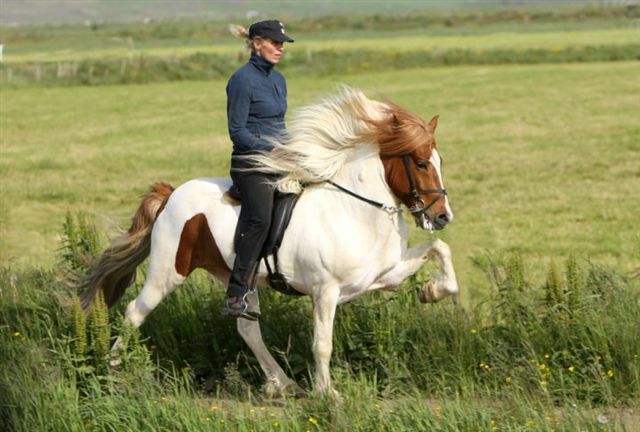 She has also 8.5 for slow tölt and canter. MF: Jarl frá Búðardal (8.10). 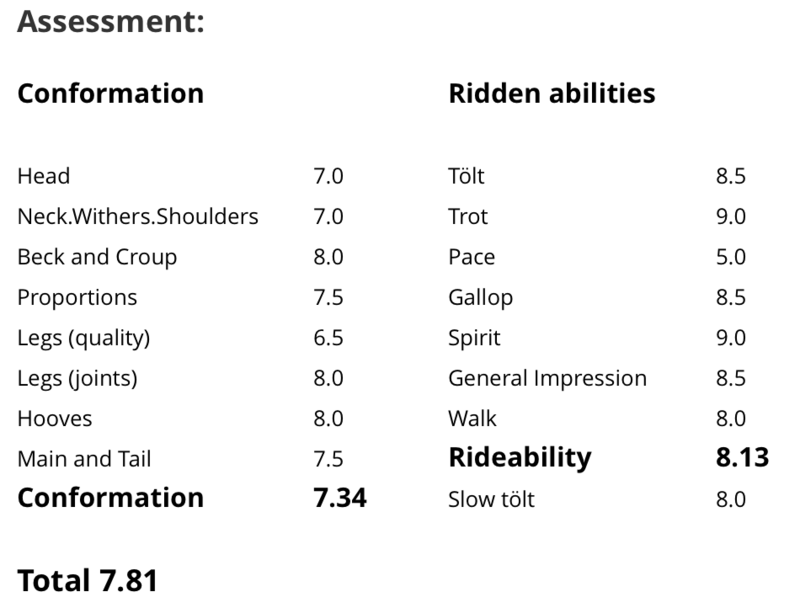 Jarl has 7.74 for Conformation and 8.47 for Rideability; 8.8 for tölt, 9 for trot, 7.7 for pace, 8.5 for gallop, 8.3 for temperament, 8.2 for character and 8.5 for general impression. Jarl is chestnut stallion with a blaze and flaxen main and tail, he is son of Kolfinnur frá Kjarnholtum I.
MM: Harka frá Úlfsstöðum (7.94). Harka was a bay mare with 8.28 for Conformation and 7.60 for Rideability; 6.3 for tölt, 8.5 for trot, 7.2 for pace, 8.7 for gallop, 8.5 for temperament, 7.7 for character and 8.2 for general impression.